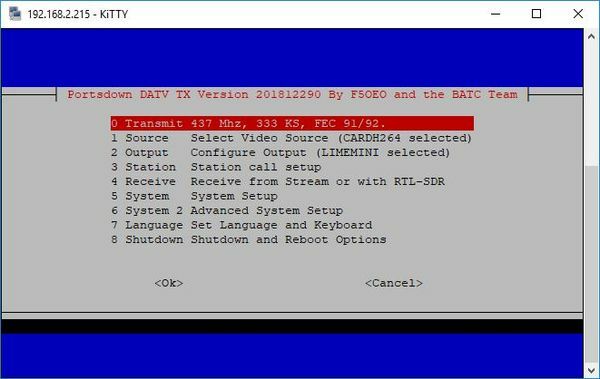 The Console provides a means to configure all aspects of the Portsdown Transmitter Software, as well as providing an interface to operate the transmitter. By default, the Portsdown transmitter is configured to boot up and be used in Touchscreen mode; however if you want to change some advanced parameters such as Display Type or set up the WiFi, simply follow this procedure. The process is very similar to initial set up and is done by using an external PC running an SSH Terminal application such as Putty. Connect the RPi to the same network as your PC, and turn the Portsdown on. If you already have a touch screen on your Portsdown, go to the info screen on Menu 2 and note down the IP address. If you do not have a touch screen connected use the IP Scanner program to find the IP address of your RPi. Open Putty and enter the IP address of your RPi and open a connection. At the logon prompt enter the default username of pi and the password. The default password is raspberry - but you may have changed this. The Portsdown transmitter will exit from touchscreen mode, the putty window will show the Console Menu. This page lists the menu options that are available as at Software Version 201801061. This page was last modified on 20 December 2018, at 10:15.